India is home to rich heritage and culture which is often showcased through its plethora of holy places and pilgrimages. 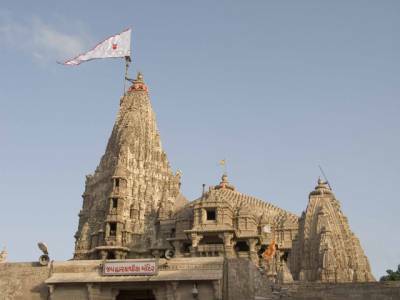 Dwarkadhish Temple, also known by the name of Jagad or Jagat Mandir is one of those highly regarded holy places that is dedicated to the Hindu god Lord Krishna and is located in Devbhumi Dwarka district of Gujarat. 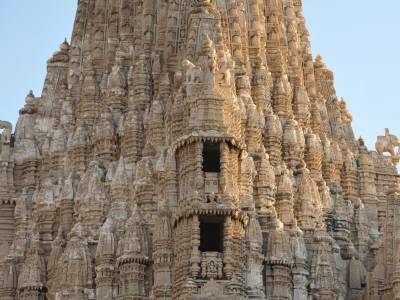 The Lord Krishna was also known as the King of Dwarka and thus the temple takes the name as the Dwarkadhish temple. It’s an entrance into the western parts of India. The Dwarkadhish temple is believed to be over 2000 years old. However, it was later enlarged in the 15th-16th century. It’s also part of the famed Char Dham, the holy pilgrimage followed by the Hindus residing in India. The Dwarkadhish temple is magnanimous and is a sight to behold. It is made up of sand and limestone and is supported by 72 pillars, keeping this 5-story temple standing proud. There’s a soaring rich spire on the exterior part. The top of the temple tower hoists a flag increasing the visual appeal of the temple. The flag has sun and moon marked onto it indicating the presence of Lord Krishna till there are sun and moon on earth. The temple has intricate carvings and details on the sculptures which gives an insight into the past civilization. It has two entrances named as Moksha Dwara and Swarga Dwara which means ‘Door to Salvation’ and ‘Gate to Heaven’ respectively. 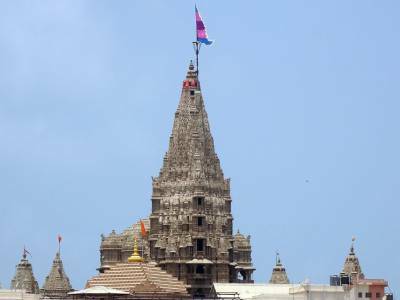 The Dwarkadhish temple opens up in two shifts from 6 am in the morning till 1 noon and then again from 5 pm to 9:30 pm at night. During the time of Krishna Janmashtami, the temple is adorned with such grace that it becomes a sight to behold with thousands of devotees coming over to oversee the festival. Dwarkadhish temple open at 06.00 AM to 01.00 PM and then 05.00 PM to 09.30 PM - All Days. 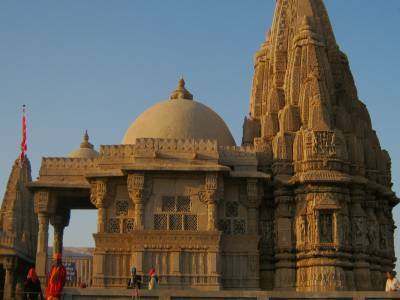 Get quick answers from travelers who visit to Dwarkadhish Temple, Dwarka.